Check out these eight art experiences if you want to see the future of mixed media and performance. 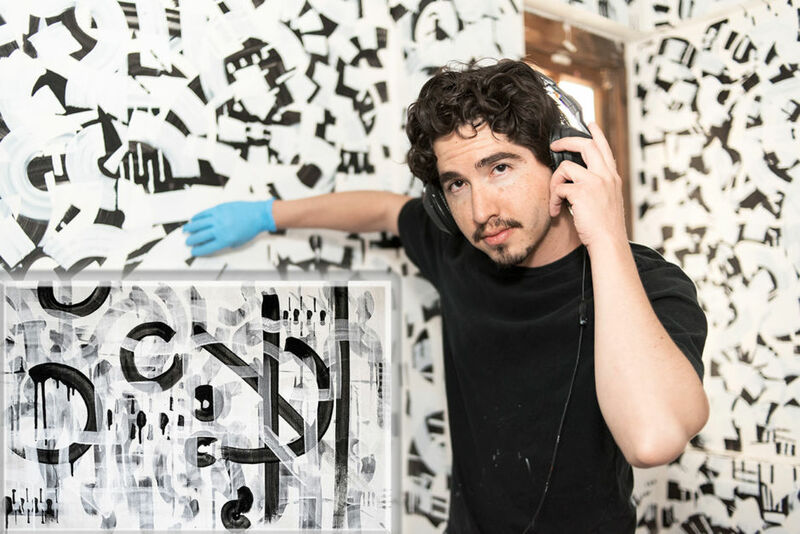 After establishing a local presence in both music and other harder-to-define ventures, the Meow Wolf arts production collective opened what they call an “immersive art installation” at the House of Eternal Return. It thoroughly departs from the traditional museum model in its bold use of interactive space. If you’re a little hazy on what all this means, don’t worry — keep reading. Maggie Thornton, a local artist at Meow Wolf, is one of the names to look out for. She splits her time between visual arts and sound for the installations, working in mostly “vinyl, plastics, and shiny stuff.” While her chosen art forms are certainly a departure from the traditional art that has drawn visitors and collectors to the city for decades, she and many area artists don’t really see it that way. “Meow Wolf is a counterpoint to much of the galleries, but there’s a compatibility between the two scenes,” she explains. 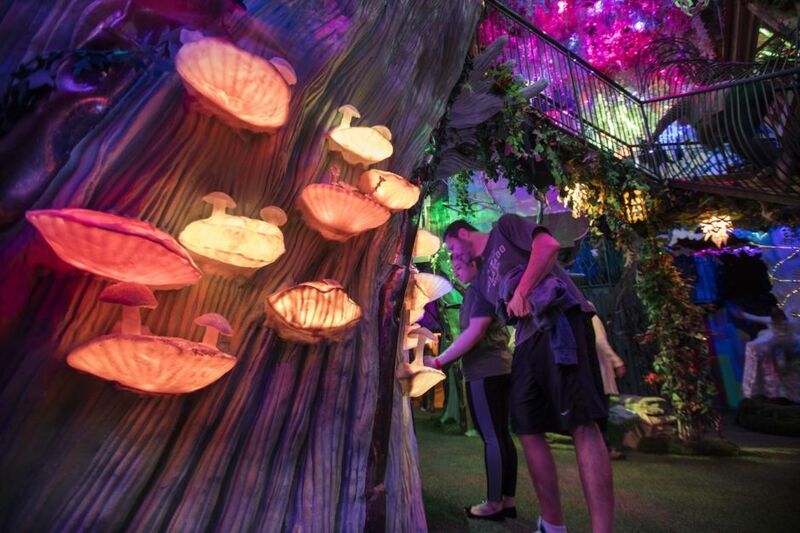 The fully interactive experience they’ve created at The House of Eternal Return pushes the envelope of what is possible for an exhibition space — an idea that quickly garnered national attention before opening its doors in 2016, thanks to city initiatives and backing by business partners like George R. R. Martin. (The Game of Thrones author also supported the reopening of the historic Jean Cocteau Theater in 2013). The House of Eternal Return is now open Sunday – Thursday (skipping Tuesdays) from 10am to 8pm, and Fridays and Saturdays until 10pm (and afterwards operates as a music venue). Tickets for general admission can be purchased online or at the door. Another more tenured “up-and-comer” is the Center for Contemporary Arts, often known as CCA Theater among locals. With an exhibition space that has a constant rotation of visual artists (the CCA is known for their awesome collaborations) as well as regular showtimes of independent and documentary films, the CCA blends creative conversation with the idea of the Hollywood blockbuster — there’s no reason spaces like this shouldn’t see the same attendance movie theaters do. Filmmakers from all over the world often show and discuss their films at this tiny, easy-to-miss venue tucked away at 1050 Old Pecos Trail. Keep an eye on their calendar — showtimes run every day, annual passes are available for film enthusiasts in the model of traditional museum memberships, and the exhibitions are constantly updating with never-before-seen works from emerging artists. In an unconventional attempt to unify the overlapping worlds of local artists and hospitality, TOURISM Santa Fe initiated a program to give visitors and residents an intimate experience of the artistic process. Behold, Santa Fe Artists in Residence. The idea in a nutshell: Hotels around the city give space and attention to different artists starting in November 2017, with events scheduled through the end of February 2018. From traditional wine and cheese meet-and-greets with the artists to the fact that they’re creating their works on-site, the program aims to create a new avenue for exposure and partnership between galleries, artists, and hotels in the city. Studio Center of Santa Fe sits in the heart of the Railyard District, within a squat rectangular building that looks like it was displaced from a West Coast shipyard. And it makes its presence very, very known with a technicolor mural and a recent installation that’s part park bench and part sculpture. Celebrating 21 years of service this year, it’s also planning some significant changes. Throughout those 21 years, the initiative was known as Warehouse 21 and was dedicated to supporting local youth artists. Now, the center is expanding its reach by incorporating new studio and gallery spaces, as well as a cafe. One of the things that’s made the program so unique and unmistakably “Santa Fe” is its commitment to hosting performances and events of all styles, from book tours to deep-trance jam bands (several Meow Wolf members got their start here, so you can see the connection). A down-to-earth, non-judgmental space, Studio Center of Santa Fe taps into an ideal way for creative people young and old to engage with the broader community — by creating the type of place where we all wish we could have hung out in high school. Slightly outside of the city proper, technically in the pueblo of Tesuque, Shidoni towers as a testament to the huge staying power of creativity in the Santa Fe region. 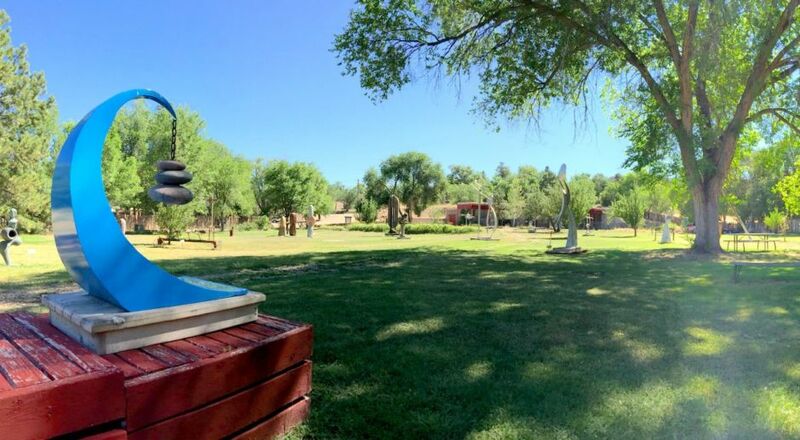 The sculpture garden seems to be intentionally out of the way, requiring visitors to follow the winding Bishop’s Lodge Road along the edge of Santa Fe National Forest. But the chance to stroll the grounds that house these abstract and whimsical structures is well worth the journey. Opened in 1975, the gallery’s sculptures are a mixture of so many styles and modes of expression that the only obvious commonality seems to be that they’re free-standing structures. Even if you come outside the normal hours for its in-house exhibit (Tuesday – Saturday from 10am to 5pm), you can still walk among the pieces outside, some of which tower like mountains, some with the fragility of pinwheels (metalworking at its finest). Form & Concept seeks to create a space to “explore the boundaries of perceived distinctions between art, craft, and design”…with a heavy implication that no such boundaries exist. Functioning as a gallery space and running workshops and artist residencies, the facility also advocates for artistic expression within the city at large — for example, by putting out a call for design ideas when a downtown plot becomes available for beautification. When they’re not contributing to the literal molding of the cityscape, they’re hosting InterPlanetary costume parties and serving as a venue for artistic movers and shakers in the area. SITE Santa Fe is housed within an architectural structure that’s a piece of art in and of itself. SHoP, a firm best known for its innovative and sustainable buildings, designed the space, taking into account how SITE’s exhibits might be experienced. 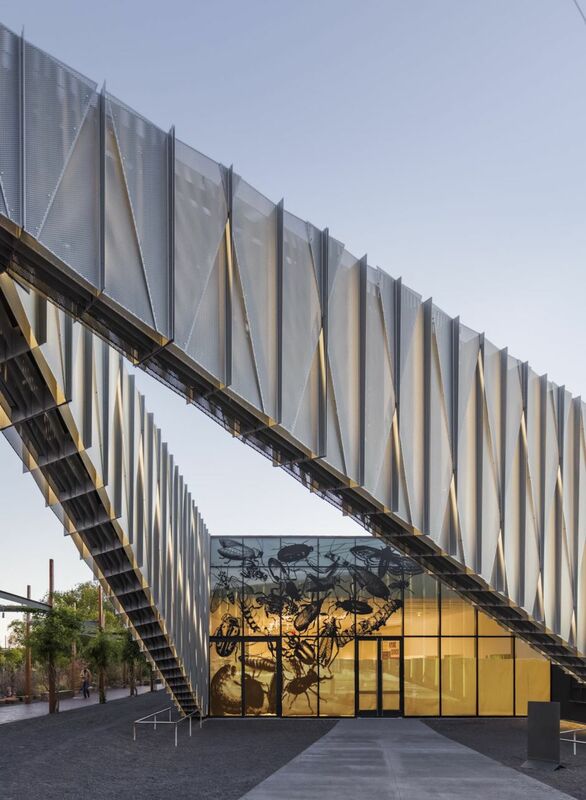 When the exterior lights illuminate the textured aluminum siding, the effect is profound — the outside seems just as much an artistic piece as what lies inside. Recently revamped (in philosophy as well as aesthetic), SITE aims to push the boundaries of standard curatorial practices. And in a show of belief in emerging artists, SITE accepts unsolicited materials from creators twice per year. The exhibits in SITElab are open from 10am to 5pm, Monday through Wednesday, and all exhibits are open Friday and Saturday. There’s free admission all day on Friday and between the hours of 10am and noon on Saturday. When you picture Santa Fe, you’re probably thinking shades of red, golds, and some adobe thrown in for good measure. But while Santa Fe is certainly set in high mountain territory, that doesn’t mean there is a lack of green. The Santa Fe Botanical Garden comprises acres and acres of striking local landscape at its most verdant and plants as colorful as many of the city’s art museums. But what makes the garden an “experience” are the events it hosts and how they tie into the community. Check out Glow — the last two weeks of December — to see the garden lit up with thousands of lights and lasers, the “Garden of Earthly Delights” celebration during the summer solstice (and the accompanying themed cocktails), or get tickets in advance to Shakespeare in the Garden. Then there’s Community Day, where students and New Mexico residents get in free. The accessibility of the garden — and the focus on the community — couldn’t be more suitable for a come-as-you-are city founded around the arts. This post is proudly produced in partnership with TOURISM Santa Fe.